Cancer expert Ramon Niekrash was suspended from his job for 10 weeks after raising concerns about the impact of cost-cutting measures on patient care. In his first national broadcast interview, he talked to BBC Radio 5 live's Victoria Derbyshire about what pushed him to act. 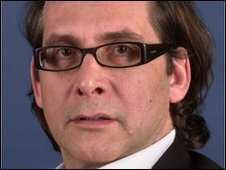 Ramon Niekrash was employed by the Queen Elizabeth Hospital in south-east London as a consultant urologist in 2000. Five years later, the hospital's urology ward, which dealt with benign and malignant conditions of the bladder and prostate, was closed. Patients were dispersed throughout the hospital - a move with which Mr Niekrash says he and a number of his colleagues disagreed, fearing that the absence of a dedicated ward and reduction of specialist nurses compromised patient care. He says his fears were justified, claiming that doctors began to notice a "general deterioration" in the way patients were managed in the absence of a specialist ward. "I'm not suggesting major calamities, people were dropping like flies", he said, "but I'm saying there were clearly problems that patients had experienced, that doctors had noted, and then I think it had another side to it, which is just the quality of care." He cited one case in which a patient was diagnosed with prostate cancer, but was allegedly not told that he had the disease nor given treatment for six months after the diagnosis. Mr Niekrash said that as soon as he had learnt about the potential closure of the ward, he began to register his concerns in fortnightly meetings and wrote about 30 letters to senior management from mid-2005 to late 2007. But he said he was unimpressed with the response. "Of the 30 that I wrote", he says, "I'd say possibly two may have received an answer, and generally they were fairly dismissive." Mr Niekrash was suspended from his job for 10 weeks in 2008 after being accused of a "vexatious" letter-writing campaign. "I think they thought I was the thorn in their side", he said. "There is no doubt that I realised by writing letters I was putting them on the spot - I realise that. "But I was doing it because I wanted them to realise that action was required." Mr Niekrash said he was "bullied and harassed", and took his employers to a tribunal, which ruled in his favour in February 2010. "I realised I hadn't done anything wrong, so I was obviously happy that the courts found the same", he said. "If an organisation is found to be wanting perhaps in their application of the policy, where is the big stick that stops them from doing this again? He says he wanted it made clear that he was suspended "for the right reasons" in order to clear his name, and so felt "vindicated" by the tribunal's ruling. "It really is a case of saying: If an organisation is found to be wanting perhaps in their application of the policy, where is the big stick that stops them from doing this again? "And I can't see any evidence that there is a big stick in the NHS." He says that doctors and nurses were "guardians" of the health service, and "should have every right and responsibility to report problems within the service". He argued that it seemed "ironic" that money intended for the health service was used to pursue a case against him, and said that he had incurred a six-figure sum in challenging his suspension, although he is now entitled to damages from the hospital. "I think we've had a staff, by and large, that has been somewhat demoralised in general... and I think they feel this is a victory for them as well." While he said that being a whistleblower was "a very lonely experience", Mr Niekrash claims that it was pressure from his colleagues that ensured he was reinstated. He encouraged other people to act in the same way if they had similar concerns. Since Mr Niekrash's claims were made, the hospital has merged into the South London Healthcare Trust. A spokesman for the trust said: "We are considering this judgement very carefully. "There are nearly always lessons to be learned from cases like this, and as soon as we have carefully considered the judgement, we will respond in full."